So, you've got a problem. When you pull the trigger, your gun's motor just clicks, but nothing else happens. There are a great number of things that can cause this to happen, but most of the time it's just the battery doesn't have enough juice to spin the gears. 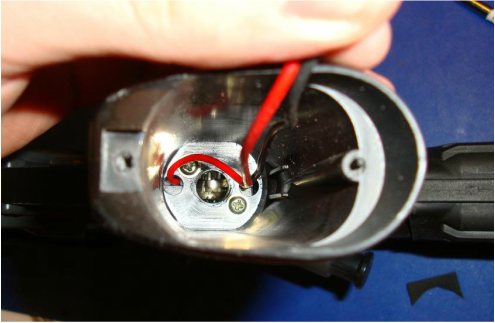 Popping the Anti Reversal Latch (ARL) can help you identify what the problem is, or fix it if it is that your battery is just weak. It will even help taking apart your gearbox, as your spring will be at rest, and won't make everything fly around. 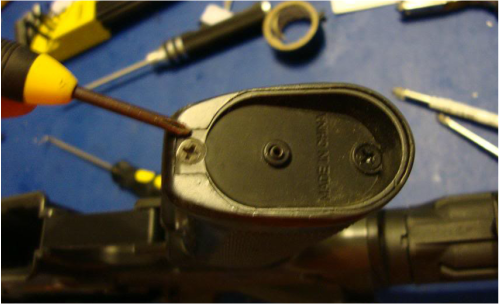 You'll have to remove your pistol grip and motor, take out the two screws on either side of the grip. You don't want to mess with the screw in the middle of the grip, that is for motor height adjustment. My base plate was stuck in the grip, if this happens to you, you can just take a screw driver and tap the side of the grip until it pops out. Removed, all pretty and what not. Careful about that silver piece in the middle of the grip. It's easy to lose, and will often get stuck to the side of your motor because of the magnets. 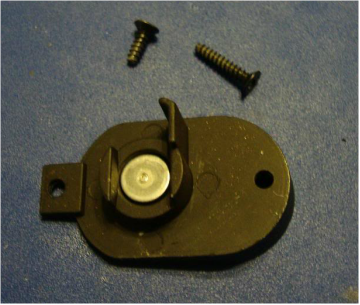 But, those are my two screws, and the base of the pistol grip, with the motor height plate (the silver piece). Again, careful not to lose this piece, it is important. Also, not every gun will have one, some just have giant screws in the middle of the base plate instead of that small grub screw and the motor height plate. Pop off the wires and pull out the motor. 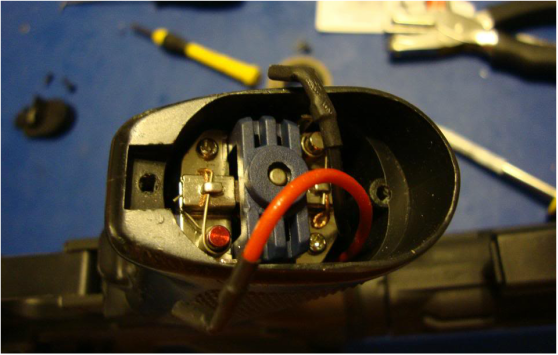 Sometimes a small screwdriver or pliers can help to remove the wires. Now, two to four more screws are inside of the pistol grip, some guns have 2, some have 4. You'll need a longer screw driver to reach down in there to unscrew them, however many there may be. And after you remove the screws, just slide the pistol grip off the gun. It should just slide right off. 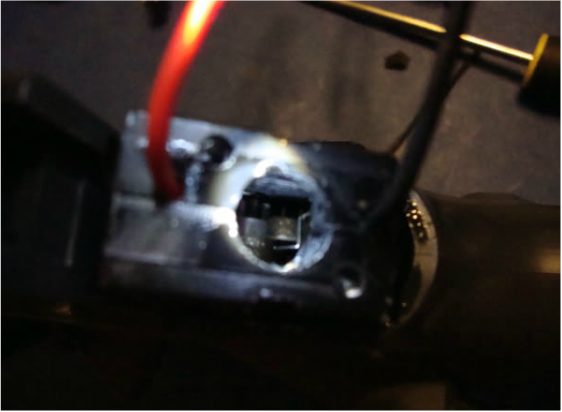 Here is the hole that the motor goes in. 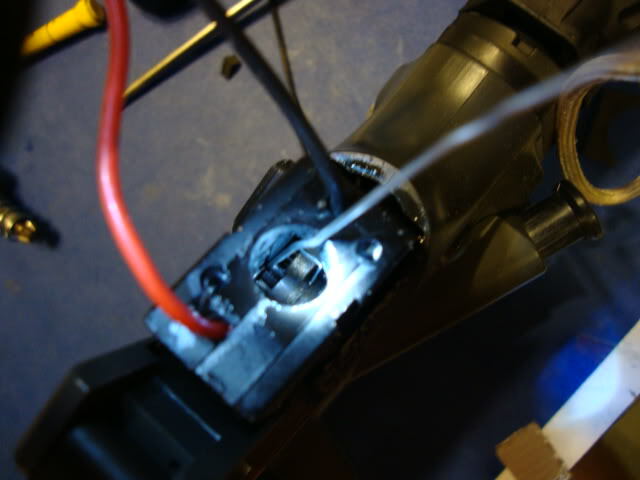 You have no idea how hard it was to get the camera to focus inside of the gearbox. Inside of the hole, you can see the bevel gear on the left. Those teeth at the top of the hole are the bevel gear's teeth. That rectangular piece on the right of the bevel is the ARL. You can even see the silver spring that pushes the ARL up against the bevel gear. Now for a magic trick. 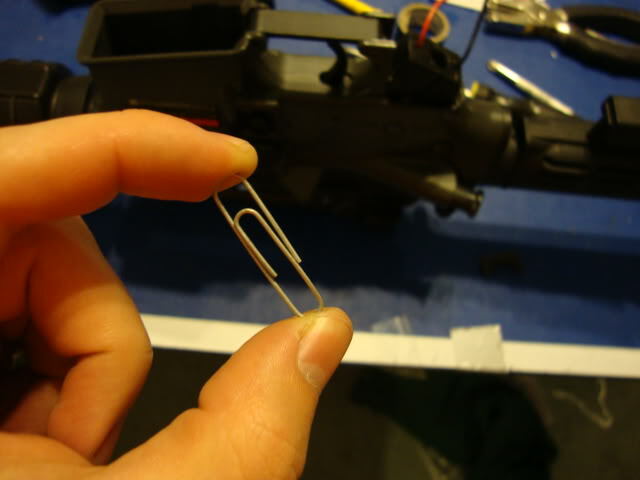 Watch me Magically turn this ordinary Paper Clip, into a marvelous ARL Release Tool! Now, before we actually pop your ARL and release the spring in your gearbox, you may want to push the nozzle in and hold it there. 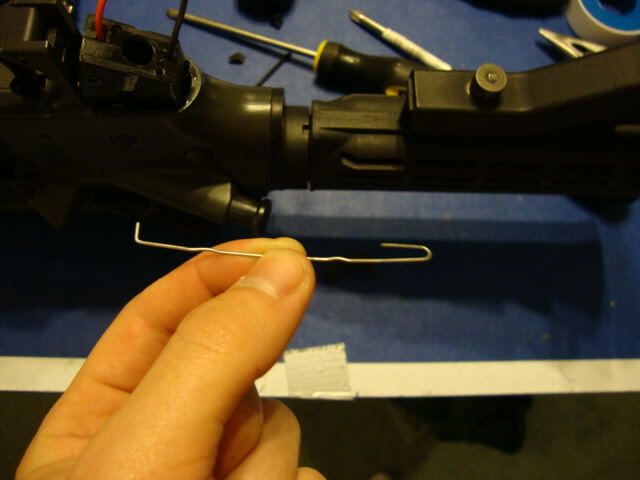 Depending on the gun and internals, you risk damaging the tappet plate by popping the ARL. Pushing it into the gun prevents it from taking any possible damage. I wouldn't worry too much about it though, I wouldn't call it a large problem, or something that happens terribly often. Notice how I've bent a notch on the left end of the paper clip, You'll need that to hook around the ARL to pull it off the bevel gear. Just angle it down in there, and give it a good pull. You'll probably have to do it a few times to make sure all the tension is released. You don't have to use a Magical ARL Release Tool, you can use a hook set if you have some laying around, or anything (I don't know what else there may be) to reach under the ARL to pull it off of the bevel gear. Now put everything back together, or continue taking your gun apart. Your ARL is popped, and now you can do whatever it is you need to do. Something else to keep in mind, in very upgraded guns, you can damage the pick up tooth of your piston. Usually if you have a strong spring in the gun. Something to keep in mind if you find you're having to do this a lot to a gun, I would try finding another way to decompress your spring. A weaker battery, or just tapping the trigger until it gets it just right. And of course, if you have any troubles, or need help figuring out what is happening to your gun, feel free to send us an email or use our Contact Form to send us a message.